11% (Entry) or 20% (Advanced) increase in the number of farms restoring or creating woodland in the past three years compared to non-scheme farms. Woodlands were more likely to be managed for 'wildlife habitat' rather than 'shelter for livestock' if farms were in the Advanced level of Glastir. 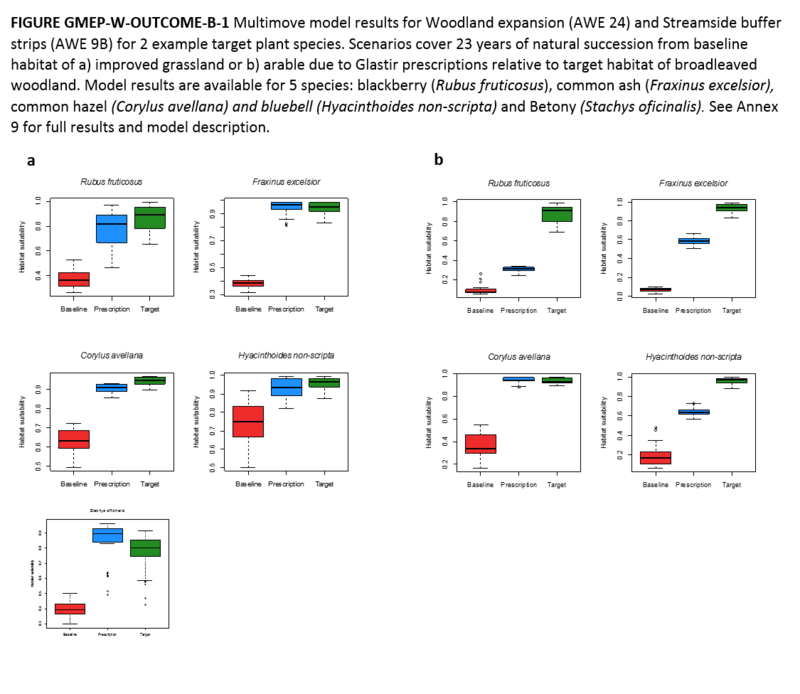 GMEP modelling results with respect to increased habitat for woodland species, carbon sequestration and runoff mitigation resulting from woodland creation and management are all low reflecting the known low uptake of Glastir woodland options. 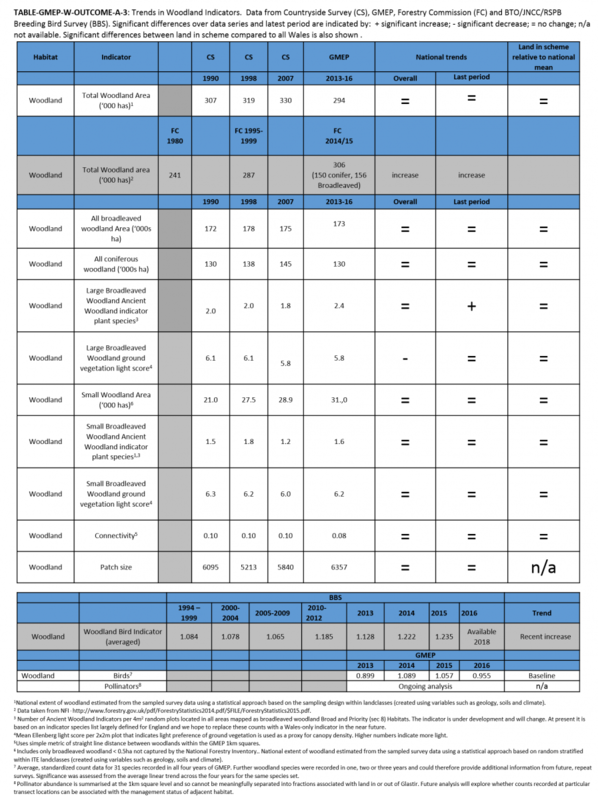 A relatively small 3% increase in area accessible to broadleaved woodland species by the end of 2016 is projected by the LUCI model in response to prescriptions included in Glastir contracts. Barriers to uptake of Glastir Woodland Creation and Management Scheme were explored using the Farmer Practice Survey, focus groups and a series of structured interviews. The main reasons for not taking up a grant for woodland management, after a general "not interested in woodland management", included "lack of available land" (29%), "insufficient time to diversify" (28%), "insufficient knowledge or equipment" (28%) and the "scheme was too complicated" (27%). There has been an improvement in the plants indicative of good condition in large broadleaved woodlands over the last 10 years suggesting improved management. 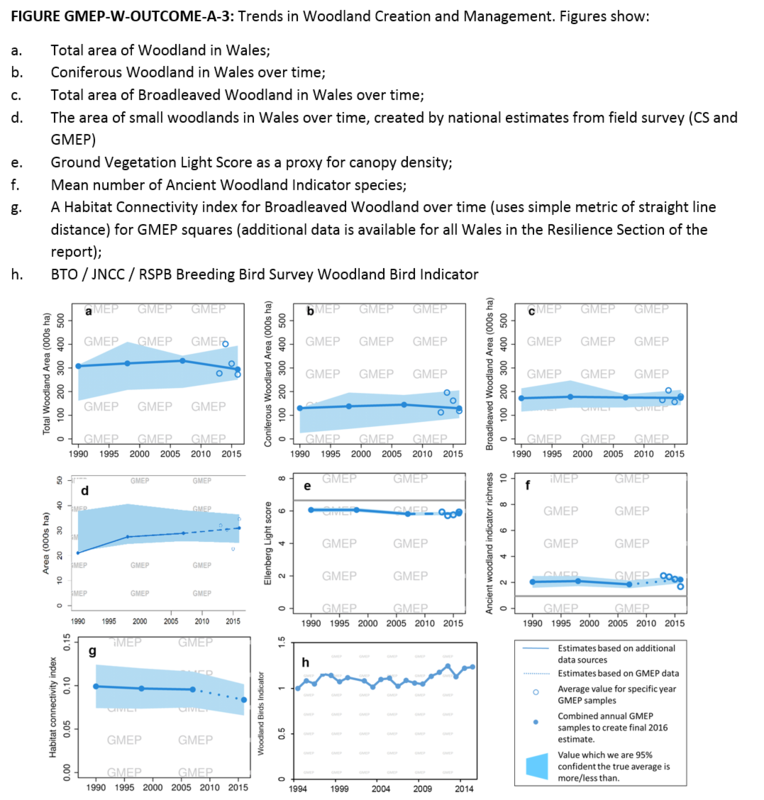 There has been a recent increase in the BTO/JNCC/RSPB Breeding Bird Survey Woodland Bird Indicator. Stability in all other condition metrics including connectivity, patch size and light/shade index in last 10 years. No change in the area of small woodlands (< 0.5ha). The small amount of area planted within the scheme (3,923 ha) is within the variability of the GMEP sample. These small woodlands are not currently captured by the National Forest Inventory and are the woodlands most likely to be affected by Glastir. This does not appear to reflect the ambitious targets for expansion of woodlands set by the Welsh Government nor exploit the multiple benefits woodlands can bring for biodiversity, carbon sequestration and water regulation.